River otters spend most of their time in the water, playing and looking for food. They typically use the abandoned burrows of other animals as their dens, adding some nesting materials to make the burrows cozy for their kits, which are born in the spring. These dens often have entrances underwater and above ground, giving the otters the security of an aquatic escape when necessary. Otters need easy access to water, so they prefer to den along the water's edge in the river banks, rock piles or hollow logs. But they sometimes venture up to 1/2 mile away from the water to den if they can't find suitable shelter, building their nests under human structures such as boat landings. River otters are found in lakes, rivers, estuaries and marshes. River otters are more likely to take over another animal's home than to build their own, but they can dig their own burrows when necessary. Although cute, otters can be aggressive, sometimes forcing animals out of their burrows so the otters can move in. They like beaver dens so much they sometimes move in and live alongside the beavers. Otters also take over the homes of muskrats, foxes, badgers and rabbits, which are dug into the dirt in or near the river banks. Their ideal dens, also called holts, have multiple entrances, including underwater entrances that slope up to a flat, dry area where they create their nests. Some log jams naturally create several "rooms," or large, dry areas that can house multiple otters. When a river otter has found a home she likes, she brings in material to make her space soft, dry and warm. Otters tend to use local vegetation, which they shred to make shaping their nests easier. They also look for moss, bark and small sticks to line their nests. 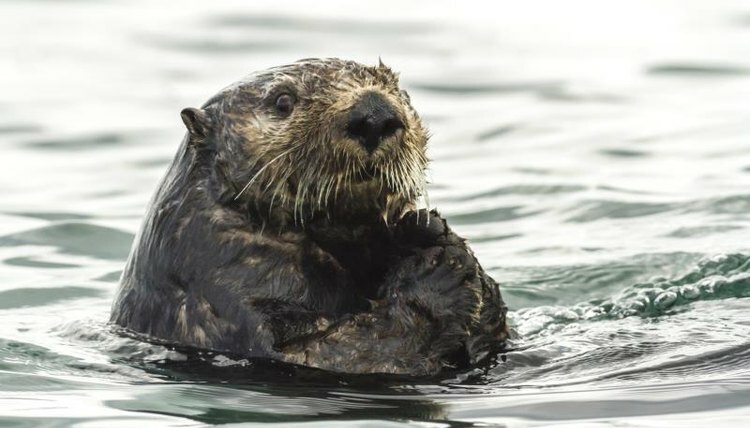 Female otters deliver their babies in the dens, letting them stay in the cozy nests until they are 8 to 10 weeks old, when they are big enough to learn to swim and hunt. River otters make their territories more homey by building other facilities. They like to roll and groom on the bare dirt, so they often frequent the same area to keep it clear of vegetation -- some of the missing vegetation ends up in their nests. For convenience when entering the water, river otters create slides, which are slick, muddy or snowy lines that offer a fast and fun way to get from land to water. They use the same area over and over until the shape and speed meets the otters' approval. This helps give the otters a quick escape from land predators such as bobcats and coyotes. They often develop trails to the slides, and they pick special bathroom areas, called spraints. River otters use urine and feces to mark their territory, but most have a spraint they use when not marking.